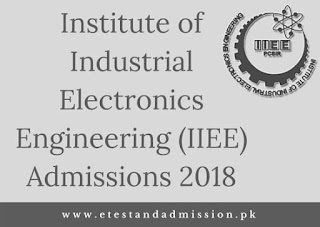 Institute of Industrial Electronics Engineering (IIEE), Karachi Admissions 2018. 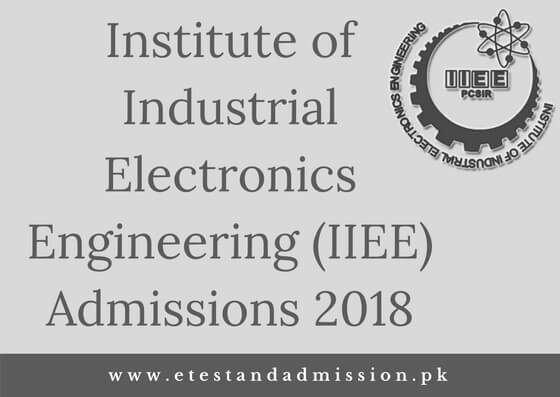 Institute of Industrial Electronics Engineering (IIEE) was established in 1989 as a Public Institute. IIEE Karachi is working under the jurisdiction of Pakistan Council of Scientific and Industrial Research (PCSIR). The Institute is affiliated with NED University of Engineering and Technology (NEDUET), Karachi and recognized by Pakistan Engineering Council (PEC). IIEE is the only Institute which is offering BE Industrial Electronics Engineering in the Country and South Asia. Minimum 60% marks in SSC and HSSC (Pre-Engineering) or equivalent. Candidates must appear in Entry Test conducted by NTS. Note: Candidates awaiting result are also eligible to apply. Candidates have to fill both the forms one for the NTS Test and the IIEE Admission Form. Fill the required details carefully and attach the required documents. Candidates will also have to submit Pay Order / Demand Draft of Rs. 1000/- in the name of IIEE as mentioned in the form and send the form at the address given.